Description: Black tea from Yunnan always has reputacion for it well saturated taste, which to some palates resembles Black Indian Assam tea. We have selected this black Yunnan tea from Wenshan area as good example how stylish and elegant leaves can be produced from Da yeh - large leaf tea bush variety, native to Yunnan region. Taste: Flowery due to large buds, mature, but never bitter. 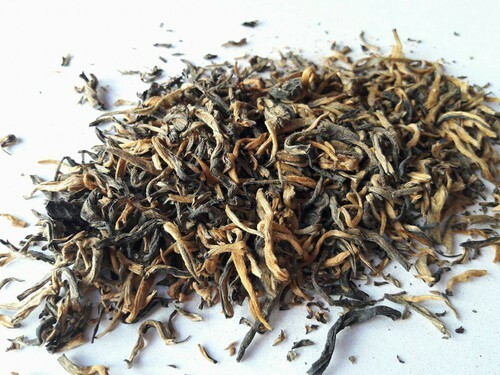 Black tea, which can produce dark brew with soft, little dry taste. Brewing instruction: Take about 3 - 4g tea on about 200ml and put it in tea pot. Boil fresh water and pour over the the. Allow to 3-5 minutes to infuse tea. Serve tea in cup. Chinese people sometimes make more than one infusion from porcion, even, if it`s black tea. You can always try, but to our experience, only one qualitative brew can be made from this black tea.